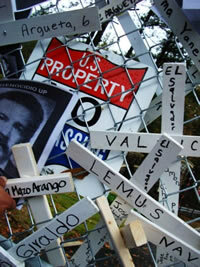 Last weekend thousands gathered in Fort Benning to protest the School of the Americas. This year it was the 20th anniversary of the SOA Watch and it was also the first time in 25 years a coup d’etat has occurred in Latin America. Despite this anniversary and the critical condition in Honduras, the turnout was meager. Some estimated that it was half the size of last year and maybe the lowest turnout in the last decade. Two major explanations were going around, the first factor being Obama’s presidency and the second factor was possibly the economy. Whatever the reason or combination of reasons, this turnout is a cause for re-evaluation. The SOA Watch had an ambitious agenda the whole weekend. Friday was the day of workshops which sadly I missed; however, Student Career Alternatives Program (SCAP), a group I’m involved with, hosted a workshop on counter-recruitment with over seventy young people attending. Other workshops included: nonviolent training, many workshops on Colombia as well as specific Latin American issues. Friday also included a protest at the Stewart Detention Center in Lumpkin, Georgia which is notorious for treating the detainees terribly. Saturday had few workshops, but focused mostly on getting people to congregate at Fort Benning with cultural events and film screenings at night. Sunday was the day of the Memorial Service, Solemn Funeral Procession and Puppetistas. I really enjoyed the Labor Caucus Saturday morning at the Convention Center. All the big Unions had a member or two present. There were two major reports given at the Caucus; Berta Oliva, the coordinator of COFADEH (Committee of Relatives of Missing Prisoners in Honduras) gave a report on the dire human rights situation in Honduras. Also, Gerardo Cajamarca Alarcon, who had to flee Colombia because of death threats, updated us on the abhorrent situation in Colombia. Berta Oliva, with unbearable gravity, reported that the current dictatorship is tearing Honduras apart. The context where the elections are going to be held on November 29th is barbaric and a “death project” against the resistance. The military has been given notices to go after the coup denouncers in the lead up to the elections. Women are not only being raped, but also being raped with batons. Men are shot in the testicles. Her human rights group has called the Secretary of Health urging to clean out the beds and cancel appointments from November 18 through December 6 to make room for the victims of the increased military repression. “I am here to tell you that what is going on now is different from the coup of the 1980s,” she continued. “This is different, the dictatorship is not afraid nor ashamed this time. This is partly due to the School of the Americas which has trained extensively and developed many members of the military from Honduras.” She concluded by saying that the situation could be ameliorated if the coup is reversed and if Zelaya is returned to power where he can finish the time interrupted by the coup. The rest of the caucus was focused on the various union members speaking about issues. There was a general concern that most unions tend to be more conservative and ossified on many of the issues they care about. They are fed up with the hired bureaucrats who are not actually workers but lawyers. There was some time dedicated to the new president of AFL-CIO, Richard L. Trumpka, who many hoped would be more susceptible to pressure from the rank and file. Trumpka’s condemnation of the coup in Honduras was viewed as a very progressive step. I questioned how progressive that really was; Obama and practically the entire world has condemned the coup. I was approached by different people – some commended my question but others became defensive. After the labor caucus, many of us made our way to a small strip of a neighborhood outside the gates of Fort Benning. Each year there were vendors on all sides and a center stage which for musicians. Frankly, the whole thing can feel like a musical festival where people can go shopping and listen to decent music with a political slant. Most of the vendors were selling items from Latin America. There were mostly peace and religious groups with a few socialist groups (Workers World, Revolutionary Communist Party and Socialist Workers Party). 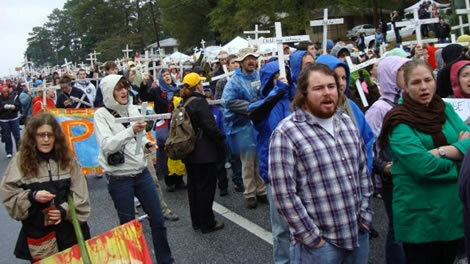 Most of the crowd – probably two thirds of the people there – were under twenty-five, mostly from church groups. About fifty of us had traveled together from Atlanta, organized by Georgia Peace and Justice Coalition, Georgia State Progressive Student Alliance, and American Friends Service Committee. Upon arrival we were handed a flier by the Coalition of Immokalee Workers (CIW) asking us to protest the slave conditions of tomato pickers who supply regional grocery chain, Publix. CIW was able to integrate the SOA crowd into their larger campaign, the National Supermarket Week of Action. About 250 people from SOA showed up to the protest and brought an incredible amount of energy and enthusiasm. We caused quite a commotion in the community, it seemed they were not prepared at all for this. After we demonstrated on the sidewalk for about an hour, we went across the street to wrap it up. I think the swarming of 250 people across the street alarmed the police who called for back-up and looked panic-stricken. They were threatening arrests if we did not disband immediately. After the protest, we headed over to the hotel for a Georgia Activist Meetup. Some connections were made, but overall I am not sure how useful it the meeting was. I had my two-year old son with me and he became very demanding throughout the meeting, so I may have missed something. Later that night we headed over to the convention center for a concert. When we got there, we were greeted by a hundred or so young people dancing to an impromptu drum circle on the balcony while the older crowd were inside for the concert. When the threat of the police disbanded the drum circle, many of us headed back to the hotels. On the way back, fellow activists from Atlanta were upset with the SOA Watch for what they perceived was structural racism. The areas around Fort Benning are inhabited by mostly poorer people of color who were not included in this weekend. I am not sure about the planning process of this weekend so I cannot comment. The next day was blistering cold and rainy as we marched around the tiny strip of land listening to the names of all the dead, which was very emotional. We left shortly after to head back to Atlanta. This weekend was interesting. The crowds were very tiny compared to other years and the composition of the crowd seemed mostly to be young people from peace groups. The two dominant topics were Colombia and Honduras, yet many did not seem to come because of the events in Honduras. I think the reason many did not come is because of Obama’s presidency. I am not sure if revolutionary socialists had a part to play in this weekend, but we could have done some things differently. None of the literature meaningfully connected the SOA, US imperialism, and capitalism. The dominant ideas of the weekend are pacifist and liberal, accompanied by radicals from Latin America – but the connection is not made. With more preparation there could have been more presence of radicals in solidarity with Latin America.